The European Commission is on the verge of a trade war with China over the import of solar panels worth 21bn euros (£18bn) a year. It is considering imposing an average “anti-dumping” import tariff of 47%, with a decision expected by 5 June. The EC argues China unfairly subsidises its solar panel firms, putting Europe’s manufacturers at a disadvantage. But some European solar panel makers are warning that such a move would amount to “dangerous protectionism”. “Protective duties are poisonous for the solar industry”, said Udo Mohrstedt, chief executive of IBC Solar, a Germany-based global manufacturer. Wouter Vermeersch, chief executive of the Belgian company Cleantec Trade, agrees. “The solar business is very price sensitive”, he said in a statement issued by the Alliance for Affordable Solar Energy, where Cleantec is a member. “Solar companies already had to cope with continuously decreasing feed-in tariffs in the past. Trade officials from all 27 countries in the European Union are expected to be briefed on the proposals at in meeting on 15 May. The provisional tariffs would be imposed even though the EC’s official investigation is only nine months into its 15-month duration. The EC can do this if it considers there is clear evidence that companies are being harmed. If the EC believes China has not altered its trade practices after the full 15-month investigation comes to an end in December, the provisional tariffs could be imposed for five years. 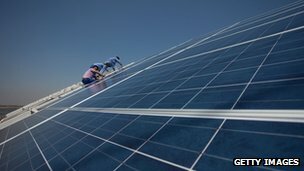 The case, involving over 100 Chinese companies exporting photovoltaic and solar panels worth 21bn euros (£17.8bn; £27.7bn) a year, is the EU’s largest ever trade dispute. The Chinese could appeal against the EU’s decision to the European Court of Justice in Luxembourg and to the World Trade Organisation.